FXArena là một nhà môi giới đề xuất một cách tiếp cận mới đối với giao dịch tiền tệ. Công ty cung cấp cho các nhà giao dịch những dịch vụ giao dịch trực tuyến dựa trên các chiến dịch và các cuộc thi khác nhau. FXArena là một công ty ngoại hối tương ứng với tất cả các tiêu chuẩn hiện hành. Nhờ vào công ty, các nhà giao dịch có cơ hội để phát triển kỹ năng của họ, cũng như kiếm tiền bằng các phương pháp mới. Tài khoản giao dịch được đăng ký với FXArena cho phép truy cập vào vô số cuộc thi bất cứ lúc nào. Hơn nữa, các nhà giao dịch có thể tham gia nhiều cuộc thi đồng thời. Công ty cung cấp một khả năng tham gia vào các cuộc thi miễn phí hoặc chi trả lệ phí. Lệ phí tham gia được rút ra từ tài khoản ngay sau khi nhà giao dịch đăng ký làm thành viên. Giao dịch được thực hiện thông qua sàn giao dịch MetaTrader4, cho phép người tham gia thị trường lựa chọn các công cụ giao dịch và cài đặt cố vấn chuyên môn cần thiết. Công ty đã được rất nhiều nhà giao dịch tin tưởng chỉ trong ba năm. Bây giờ, bạn cũng có cơ hội để đánh giá dịch vụ của công ty. Thêm bình luận Các nhà môi giới khác có quan tâm không? I have joined FXArena for more then a month and all of my trades have been executed as the trading provisions. They give 15% to 20% profit along this time and I expected more so I made deposit until now. But 3 days ago I can't make a withdrawing. Thus, I wait until now, but I still got no money in my account. Therefore, I contacted to their support, but they still saying that they were checking my request. I'll wait but just to take my money back, not to deposit any more. I think I have to find another broker. I hapo they make improvment so many trader will join them. FXArena's service isn't good for me. As last five months, I have a lot of issue in trading with them. First, their execution is slow on the MT4 Platform and when I want to open or close a position, the order executed 20 to 40 sec delay, So always my position get 1o to 20 pips slippage. Also most of the time the platforms are freeze or disconnects from the server so requotes is a common problem. That's why all of my profitable trades being losses. I see they haven't any regulations and FXArena's activity as like a market maker broker. So, now I have avoided them for trading in the market. FXArena used to be good, but are now they are bad like any other. Last week I execute 36 orders on EUR related pair and my 18 orders close with successfully and I make profit around $345. This week when I trying to login my account it showing my account has been blocked. Instantly I email them and reply me that they block my account because they found unusual activity in my trading account. That means making profit is unusual activity for them? I'm moving my money there as soon as possible. 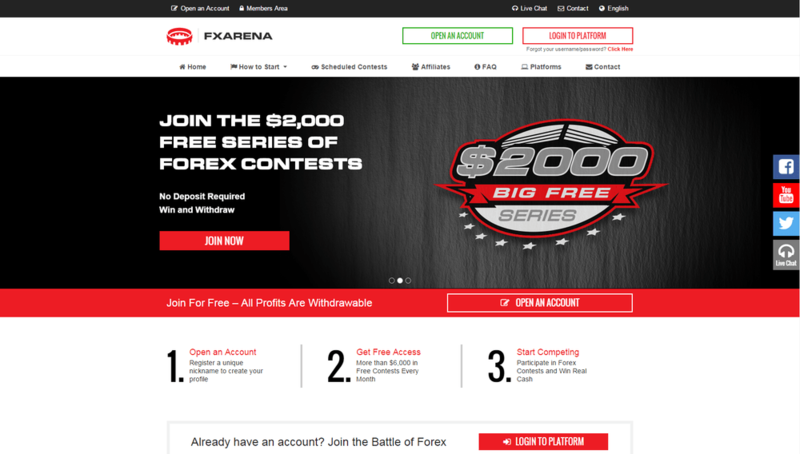 I have a standard account with FXArena and I will soon close my account. My first deposit was 200$ with Qiwi, and I lost it after 3 weeks of trading. I deposited again 100$ and manage to make 200$ profit after one month of trading. The Metatrader 4 platform crashes or have delays during volatility times. The closing price is different then the market. I called many times the support team but they pun me always on hold. I traded with them currency pairs EUR/USD, GBP/USD, USD/JPY, USD/CHF.I don't recommend the broker because the trading conditions are against the traders and lack of support team. It's a terrible idea to work with this broker, especially participate in its contests. I joined one of them called Big Free and although I won the contest, up to now, I haven’t received the prize the broker promised on its website. I fulfilled all the conditions and terms, I don’t know what happened. I have sent several emails to support department, but managers always told me that my request is in process. Also, I have won around $100 in my trading and I wanted to withdraw $60, but the system allows neither. I don’t know what to do. But what happens now is a bad signal, it shows me that this is not a serious broker. I have an account with FXArena and I am the most unhappy client of them. I had deposited $500. After trade 20 lots, I have profited $90 and last month on 23 July 2017 I make a withdraw but they block my accounts for trade with them. Five weeks passed but I am not getting the money till now, support didn't help me, they only said it is still in processing and we will try. I am so boring now. Although FXArena's service is poor and platform execution is worst but I have a participant in the FXArena's Big Mini contest and they cheat with me. They didn't give me weekly $5,000 prize bonus on demo. Because I have fulfilled all their terms and condition on demo account. Besides In my five months trading experience on a live account, I have 55 trades and make $57 profit only by depositing $250. I found their main problem was slow execution and freeze platform. I saw on a forum that FXArena hasn't any regulations because IFSC shut down their activity. So now I have avoided this broker and suggest others to avoid them. At this moment I still trade with Fx Arena and found that it is still consider as one of the most reliable broker in the region. The Mt4 platform is well-designed and most important it always ease charting activities without so much unnecessary indicator or signal. I mostly trade on EUR/USD pair as one of the most desired pair and for me I prefer to focus on single currency pair than multiple trade so I can focus and give more attention to generate more profitable trade as well. I am so thanks that along my journey with Fx Arena I don’t have so much problem especially when dealing with the introducer of the broker. They are very professional while dealing with trader. Last time, I experienced problem on deposit matter but it can be solved in less than 1 day. This broker is well-recommended especially for newbies and it is also good to have demo account like what I have before to gain more experience before enter real trading process. I see a lot of traders joined FXArena but I felt let down. Platform suddenly disabled. I even not being able to make the process of trading. To this day it is still happening. I immediately call customer service and ask for help about withdrawal process because I want to take all my money. They did not help me until today. All the pages in the website where I can control my account are also inaccessible. I'm disappointed because FXArena should be able to help me. I'm still waiting for help from them. I hope they can help me. I joined this broker because I like their contests. I currently play in Big Mini contests and I hope I will win. Till now ( it's been over 2 months ) FXArena is a great broker. I trade mainly currency EUR/USD,USD/CHF, USD/JPY, USD/CAD, EUR/GBP on the MetraTrader 4 platform, the execution is fast and the prices are real. I had a problem with some closed positions during the night and the support team helped me and reopened the positions and credited my money to my account. Honest and reliable broker!